While at the Monastery of the Transfiguration I did some valuable reading. The monastery library has an excellent section on the Church Fathers and I will share some of what I read in the next few weeks. I especially enjoyed reading St. John Chrysostom’s Homilies on Genesis, published in 3 volumes by The Catholic University Press of America (part of The Fathers of the Church series). In these sermons Chrysostom exhorts his listeners to hold fast the Faith once delivered. His insights into Genesis point to the immense love of God for creation and for the only creature made in the image and likeness of God. I have more to say about about St. John Chrysostom's remarks on Lamech. 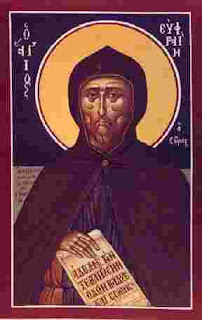 For St. Ephrem types, symbols and patterns are woven throughout creation and are Christ God’s invitation to us to perceive Him and to share in the divine life He offers. If you have read my essay on Abraham and Moses (published here on April 12, 2007), you know that I believe serious Bible study involves teasing out the pattern of divine revelation by looking for parallels, reversals, types and symbols. Imagine how delighted I was to discover that I've been following St. Ephrem's footsteps! Here is an example of the richness of St. Ephrem’s typology: He understands that the Incarnation began when the Word was spoken into Mary’s ear as an antidote to the serpent’s venom put into Eve’s ear. The life-giving Word spoken to Mary undid the word of death spoken to Eve. I hope you find these writings as nourishing as I do. Let me know what you think. I love the idea that the Word spoken was the beginning of the Incarnation as an antivenom! I have long felt that Mary's, "Yes,"to God was the counter to Eve's, "No." That's why I had to go away to a monastery. The world seems to intrude on what is really important spiritually. Reading Scripture, prayer, and reflection are eaten up by the tyranny of the urgent. You know, if we can get a real Anglican witness up and running here in South Dakota, you would be such a wonderful retreat leader! The stark natural beauty here just begs to be interpreted through readings from St. Ephrem and other Orthodox lights. YOU and your family are a true Anglican witness in South Dakota! You are salt and light. God is already blessing you and granting grace through your faithfulness, obedience, suffering and yearning for HIM. Remember that St. Ephrem and the other Fathers belong to the whole Church. That's why they are called "Fathers of the Church". I am so glad you have found the richness of the Church Fathers to fill out so much of what God has revealed to you through life experience and the study of His Word and natural revelation. St. Ephrem sounds like my kind of writer...I will have to read his "Hymn." Do you have a source?